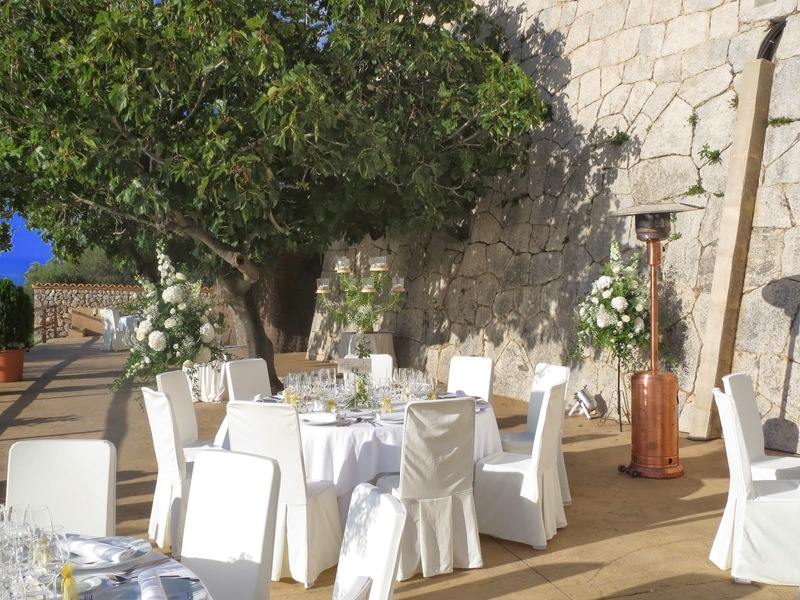 Well, last Saturday was our last wedding of the seaon – sixteen weddings in the month of September alone and it was fitting that the setting for this ceremony was in Deiá where we began the season back in May. Our wedding at the beginning of May was quite tricky as the ceremony was up at the beautiful location of Son Morraig, around the marble dome and it rained! Not good for the wedding guests who had flown in all the way from America and there was nowhere for them to take cover... Last weekend the forecast was also bad, but luckily the service was to be held in the church in Deiá with the reception being at Son Morraig, where there is also an indoor option. But, as is often the way here in Mallorca with weather forecasts, thank goodness the rain clouds were blown away and there was a stunning blue sky. 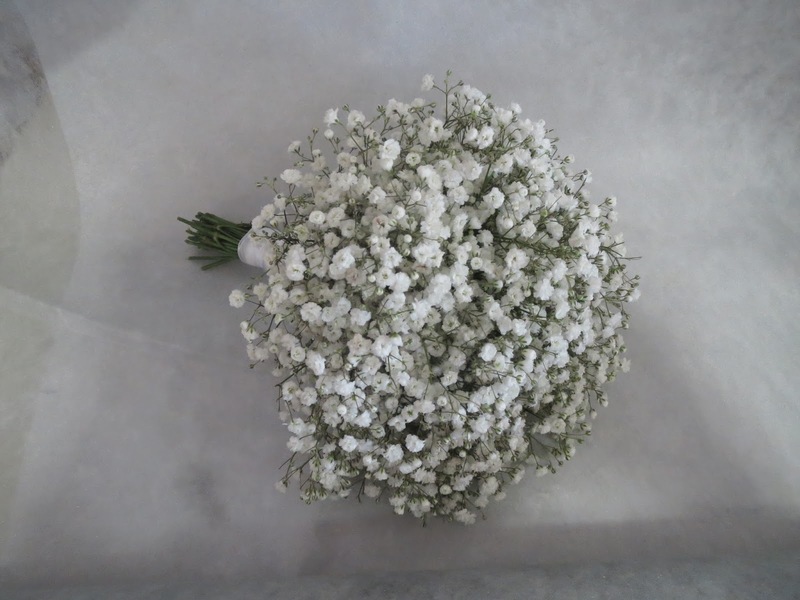 As I have written here before Gypsophila, Latin name Paniculata or Babies Breath in America, has been extremely popular this year and it featured heavily in this wedding also. 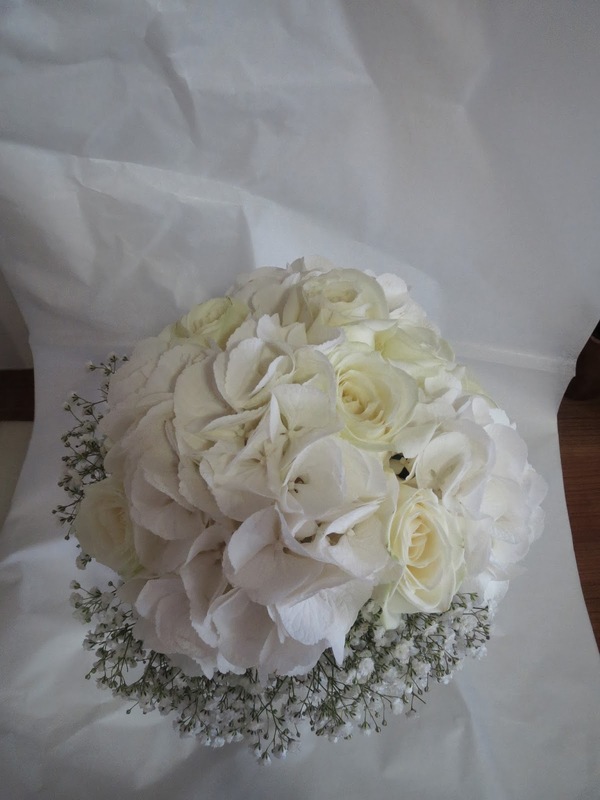 The bride ́s bouquet was made up of white Hydrangeas with Roses grouped together, with a skirt of Gypsophila around the edge. and the bridesmaids ́posies were simply bunches of Gypsophila only. 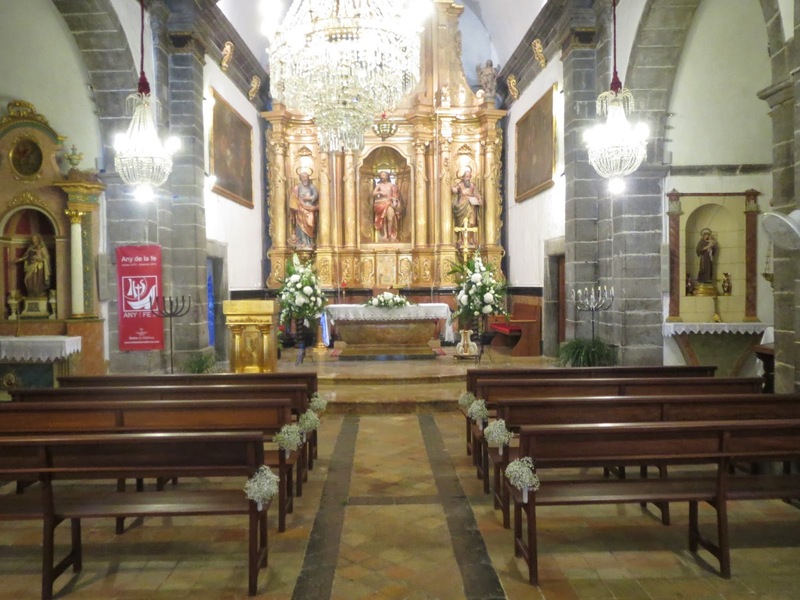 We decorated the church with large pedestal arrangements, 1.2 metres in height, which always look big in the workshop, but seem to shrink when put into a large church and an altar table arrangement. Onto the pew ends we placed more Gypsophila, which really does work very well down an aisle. After setting up the church and delivering the bridal party flowers we then set off to one of my most favourite locations, Son Morraig. 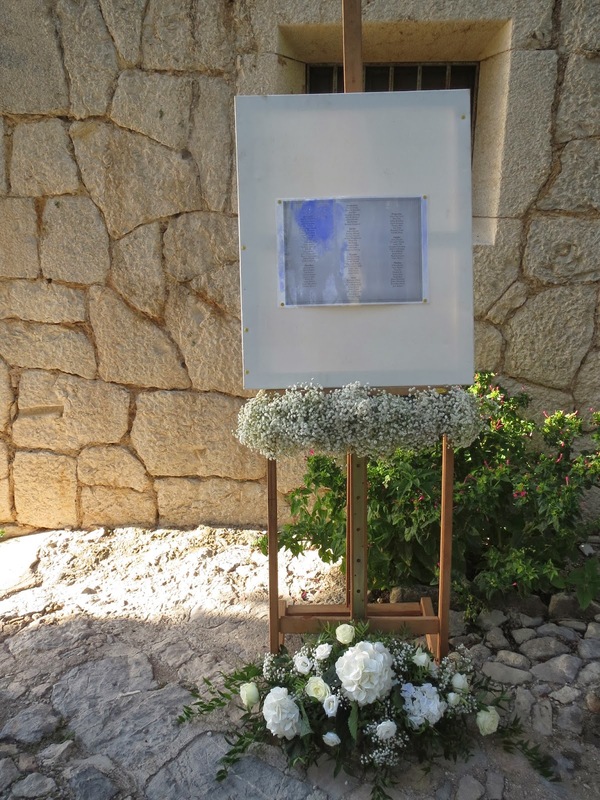 Here we carried on the Gypsophila theme using our candleabras which we decorated with foliage also. Once we had set up the tables we then raced back to the church as another service that we offer is to take the flower arrangements from the church back to the reception. This is popular as obviously it is quite an expense to have flowers in the church only for 45 minutes, but if we move them back to the venue they can be enjoyed for the whole evening. This is always a bit of a challenge to do and makes me feel like Anneka Rice on a challenge - waiting for the Bride and Groom to leave the church, with their guests following behind and we slip in the side door and whisk the flowers out, hopefully unseen, load them into the van and zoom off whilst photographs are being taken, put the flowers in place at the reception and by the time the wedding party arrive all is set up! These large arrangements are extremely heavy though and perhaps rather more tiring to carry out this task that you can imagine! Here we put the large church arrangements either side of the Top Table, which would be a good backdrop for the speeches. Here we jazzed up the rather plain table plan using the altar table arrangement at the feet and the Gypsophila pew ends in the middle. It seems quite unbelieveable that I won ́t be racing off to another venue somewhere on the island this weekend for another wedding, just a couple of marinas with some yacht deliveries. 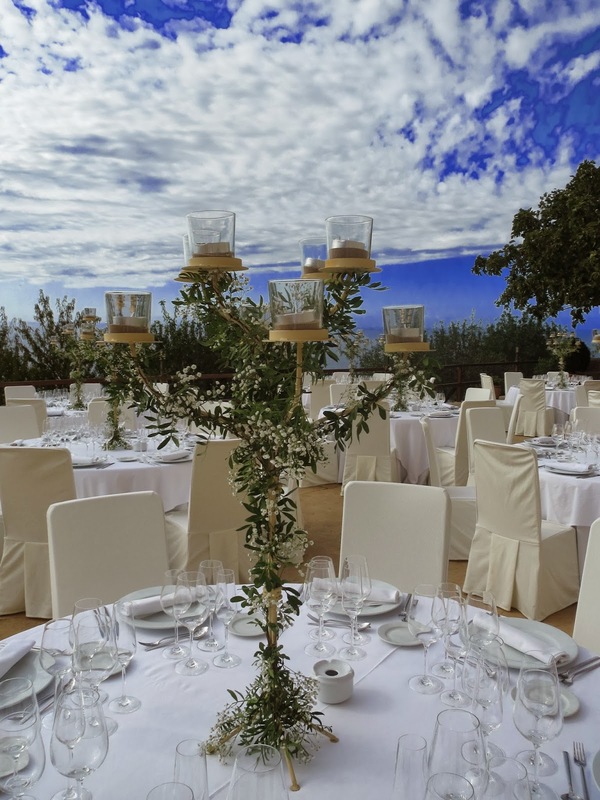 Now is time to turn my mind to the emails which are have been stored until a quieter period and the mountain of quotations for next year ́s weddings. The seasons change and work changes for me too – more time on the computer, watching out for the trends for next year and lots of time putting together proposals and quotations. Inbetween, we do of course have Christmas, which I love and shall now look forward to once again getting out the glue gun, which is always in use when making up little Christmas tree arrangements and spice garlands. This week when I visited a friend she presented me with a present from her garden, unlike anything I have seen before, hard to believe that it comes from the Citrus family. 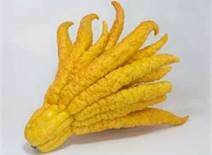 Is is nicknamed The Buddha´s Hand or Fingered Citron (Citrus medica var. sarcodactylis). So I have cut lots of wild Rosemary which is flowering in abundance at the moment, some flowering lavender, lemons and mandarins. Find a wooden platter and using some oasis soaked in water will help the arrangment to last longer (rather than simply placing the herbs/foliage on the platter, which you could do if you only wanted it for an evening). Then place the mandarins and lemons into the platter. I always like to group the flowers or fruit together as it gives a more natural look, as if they were growing. Add the Rosemary, pushing the stems into the oasis inbetween the fruit and around the back. Fill the rest of the oasis with Lavender. Here I have deliberately kept it long so that it will flow over the edge of the platter. The Buddha´s hand is reaching over one way and the Lavender spilling over in the other direction. 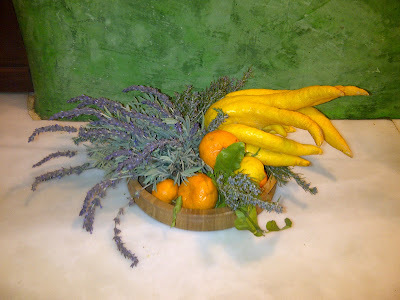 If only we had smell-o-vision here – the heady scent of Lavender and Lemon is delicious – a platter good enough to eat! Having had flower shops in London for many years and hardly ever seeing fruit and flowers growing in my close environment (other than in my garden) it is one of the joys I find of being here in Mallorca. Living in the countryside and daily walks with the dogs have opened my eyes to a wealth and abundance of different flowering shrubs and foliages. Certain days I do miss the freedom that I had with busy shops with discerning clients who were constantly looking for the latest trend or style in flowers and I would, therefore, order from Holland a complete array of exotic blooms to sell. Holland is the largest importer of flowers as well as exporters, so the flowers would have originated from all corners of the world. Regularly, I would order in a flower called Chocolate Cosmos, (Cosmos astrosanguineus) which is a little dark red/brown coloured flower, that actually smells of Chocolate and I would place them in a little pot by the till and challenge customers to tell me what they smelt of – we rarely sold any as they were rather expensive, but would add to the shoppers experience of coming into our shop! Of course I still import a lot of my flowers from Holland for our weddings, event, yacht and many clients, but at this time of the year, when all is a little quieter, I do enjoy foraging around to see what I can find and thinking what I can make when presented with a gift as unusual as the Buddha´s Hand! 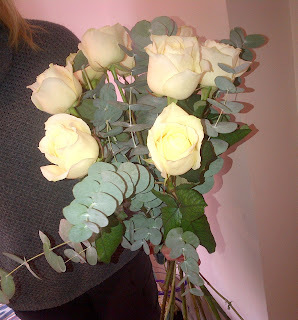 ROMANCE AND ROSES... Valentine´s Day! This is one of the times of year that it strikes me the most how different my professional life here in Mallorca is, compared to my London days. The dawning of Valentine's Day when I owned three flower shops in London, was a time of lots of planning. I would have to double our staff for a three day period, hunting down available free-lance florists who weren't looking for exorbitant pay, finding drivers who knew London well, whilst also being able to handle flowers with care. 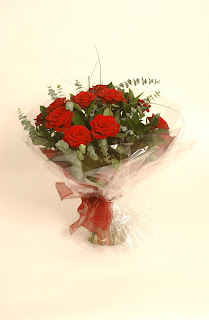 The ordering was also a task to keep me awake for many a night - if you over buy and are left with Roses, your profit is gone. Would people opt for white or pink instead of the traditional red Roses, would the discerning customer steer away from Roses altogether? Once the buying was calculated, orders would starting rolling in, either over the counter or by telephone with some clients leaving cryptic messages and swearing us to anonymity and even over the years a few marriage proposals. Bows would be made up of many evening at home, whilst watching the television. Once the flowers arrived at our doors the dreaded task of conditioning the Roses would commence... We actually invested in a de-thorning and Rose striping machine, which had rubber spiked cogs, electrically charged that you pushed a few stems of Roses into - a certain amount of muscle power was needed no to let the whole stem, head and all, be sucked into the whirring cogs. For a few thousand red Roses and a hundreds of other coloured Roses this job would take many hours. 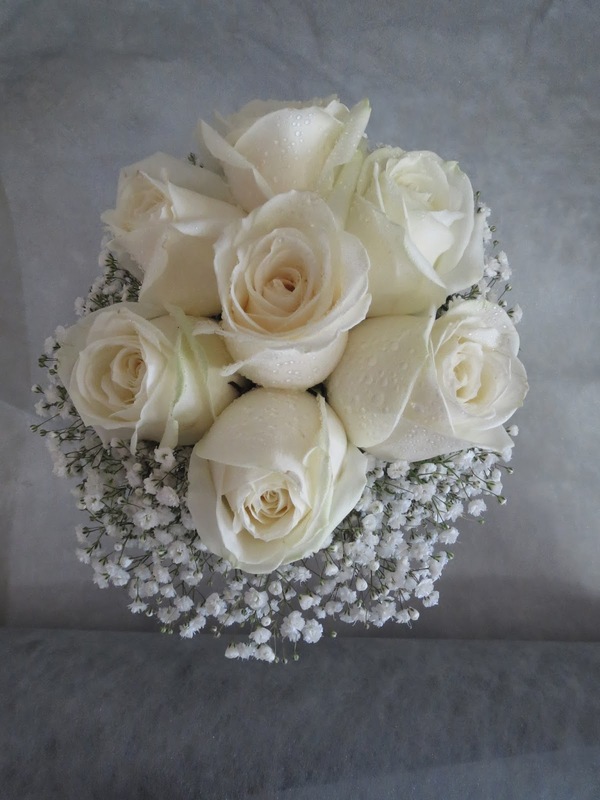 Stems would be cut and placed in buckets of fresh water, which rubber bands tied around 6 and 12 stems for ease of eventually making up the bouquets. Usually on the 13th February I would work through the night, with a team of florists who may leave at 10pm only to return at 5am. Security guards would protect the stock overnight as a few of the shops were on main-line stations and there was simply not enough storage space to put away the flowers. Drivers would arrive at 8am and be separated into areas, north, east, south, west or central London. Extra care being taken to attach Valentine helium balloons, chocolates or teddy bears to bouquets as ordered and even the odd bottle of Champagne. 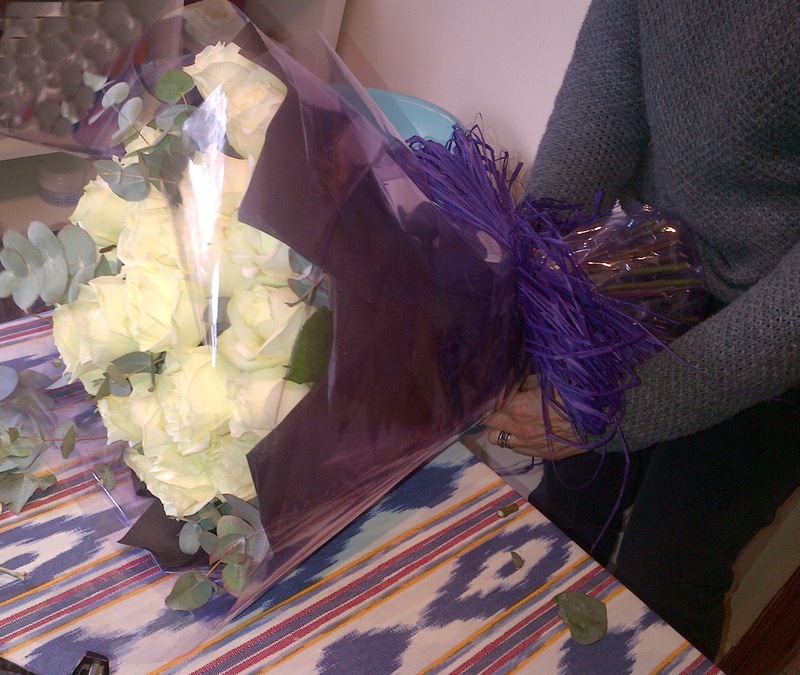 Once the drivers had departed and deliveries were made the phone would start to ring with people begging us to inform them of who the mystery sender was of their flowers, whilst also taking orders from clients in a panic who had not forward planned. In the evening rush hour customers would come to the shops knee-deep to pick up a bouquet on their way home. All hands would be on deck, serving the commuting public, with one person dedicated to operating the credit card machines and one on the till. As the vases emptied and the clear up operation began there was always, for me, a feeling of being on a real high - all deliveries made, lots of Londoners lives enriched with the Valentine's day thrill and a job well done. Us florists would then return home, with aching limbs and often bleeding hands from the stray Rose thorns and dream only of falling into a hot bubble bath and certainly no desire to see another Rose for quite some time and certainly not having the strength to be taken out for a romantic candlelit dinner, that could wait until another day! So here on the island of Mallorca things seem to be quite different. I am told that for any romantics here it would be more common to give a single Rose to their partner OR take them out for dinner and probably in these "crisis" times it would be too frivolous a gesture to shower your loved one with gifts. 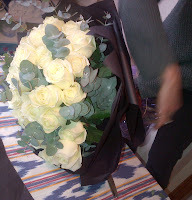 We make a few bouquets up, but are certainly not overwhelmed with a deluge of orders like my London days. 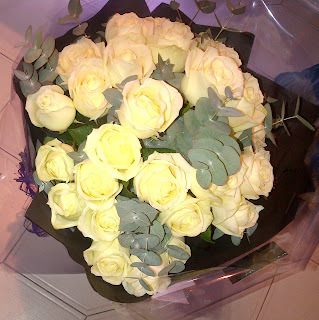 A client rang a few days ago to say that he was desperate to obtain 30 of the best long-stemmed white Roses he could find. Having missed the cut off for ordering flowers to be delivered to us in the normal way from Holland, I.e. via ferry, the only option was to have the flowers flown in, incurring high charges, but this seemed acceptable. So a trip down to cargo at the airport and the flowers were here. Stems stripped and Roses conditioned and put in water for a few hours to drink and re-cooperate from their journey. Eucalyptus was also prepared, stems cut and lower down foliage removed. After a few hours I put the Roses together. Adding one stem at a time with a few stems of Euclyptus and gradually building up the bouquet, placing the stems at a diagonal in my hand, always keeping them going the same way. After holding about twenty of the stems in my (large) hand it becomes impossible to hold it altogether and the bunch has to be securely tied, enabling you to keep on adding more stems without fear of any slipping out. 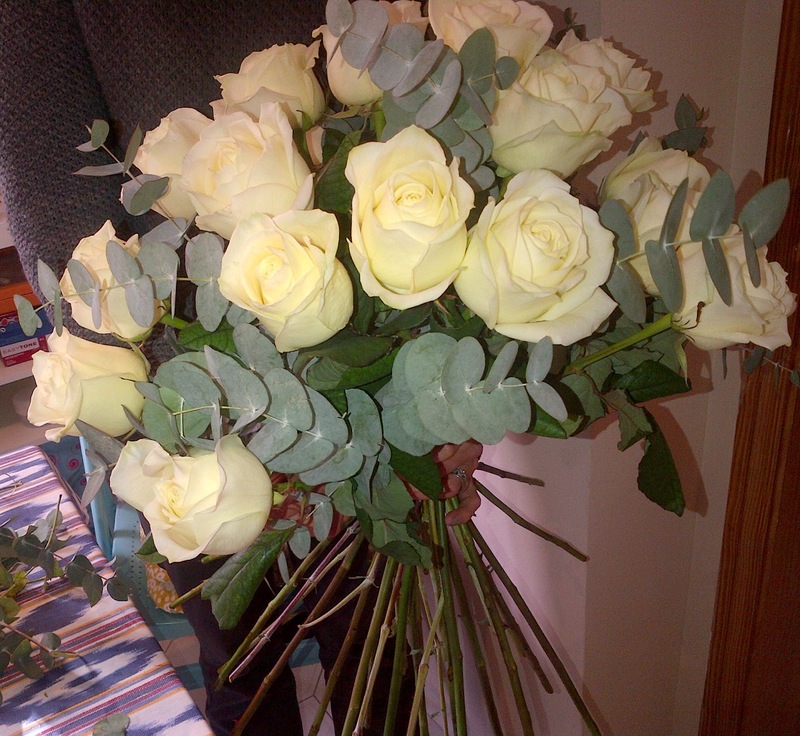 I made the bouquet up in a domed shape, with the tallest Rose in the centre. The bunch was the again securely tied. Taking two squares cellophane I wrapped this around the base of the stems and tied this tightly around the tying point of the bouquet. Triangles of tissue were then added loosely around the bunch, cello taping them together to make a skirt of tissue. This process was then repeated with cellophane on top of the tissue. A bow added, flower food attached and there we have a stunning bouquet of the best Roses available flown especially onto this island. One happy client and I am sure gratefully received! Enjoy your Fabulous Flowers for this week. One of my favourite ways of displaying flowers is in jugs. They certainly suit our rustic finca and a little jug of flowers, bringing some of the outside inside, on a brunch table adds to the setting. I have an array of jugs that I have collected on my travels, and a great momento of trip, for example from a little pottery up in the Scottish Highlands, one I have from Hay-on-Wye market in Wales and of course, ones collected in Mallorca also. To make a little jug of flowers it is best to start with a posy of a few different blooms for interest. to hang upside down to dry, so that the stems dry straight). Euclyptus also dries well. where there is a leaf, so that you don´t waste any of the stem. is lovely on a brunch table or on a bed-side table. the flowers almost spilling out of the vessel. Bouganvillea grows bountifully here in Mallorca and is hardy, not affected by sea spray, hot and cold climates, which is why you see it swathed over houses, even coastal properties. It comes in a big variety of colours now, from white, corals, pinks through to this cerise colour, which is probably the most popular. use the last blooms for this week's article. We have a couple of bushes down by the car port which have been allowed to grow freely, shooting off these lovely long tendrils. I cut the longest, healthy ones I could find. I have also used a couple of plants of small leafed Ivy (Hedera) which I always have in stock, as once they have been cut with a little care they will have sprouted new shoots for the next season. The idea is to make a circular wreath of the Bouganvillea and Ivy which you can make by tying a long piece of ribbon to the stems and winding the ribbon in and out, pulling quite tightly as you start to make the circle. Bouganvillea does have some nasty thorns along the stem, so it is a good idea to snap or cut these off before you begin to work. Keep going around adding stems as you go, using the longer ones first and when you get back to the beginning cut the ribbon and tie tightly. Then cut some of the Ivy trails and start adding these, wrapping them around the wreath, leaving some shoots to spring out. This should be a natural style arrangement, not too tight and formal. ...or you use it as the table centre piece (if you wanted to be the Hostess with the Mostest,you could of course hang it on the door and whilst your guests are sipping their aperitifs, whip it off the front door and put it on the table)!! Place a glass vase in the centre of the wreath with a candle inside and then take five smaller candles or night-lights around the edge. Wrap some more Ivy around the smaller candles and scatter some flowers heads on the table.